Teeth whitening is a common cosmetic dental procedure among people who wish to improve their smile. Your teeth can become stained for a number of reasons, but the most common reason is from consuming highly pigmented beverages like coffee, tea, and red wine. Smoking and poor oral hygiene can also contribute to stains. To help remove stains for cosmetic and oral health reasons, Dr. Tyson recommends teeth whitening procedures. Teeth whitening procedures can remove years of stains in a single session and lighten your smile by about 5-10 shades. Your teeth’s enamel is porous and will become more transparent as you age. Its transparency allows the yellow color of your dentin layer to become more visible. This is why your teeth appear to get yellower as you get older. Dr. Tyson welcomes new patients. Call 256-258-9333 or fill out the form found on this page for details. Am I an ideal candidate for teeth whitening? Ideal candidates for teeth whitening procedures are those who have moderately to severely stained teeth. Teeth whitening procedures are also available to those with mild stains who simply wish to improve the appearance of their smile. However, individuals with receding gums, cavities, worn enamel, or gum disease may require treatment for these preexisting conditions prior to having their teeth whitened. To find out if you are an ideal candidate for teeth whitening, schedule a consultation with Dr. Tyson of Tyson Dental today! How does teeth whitening remove stains? 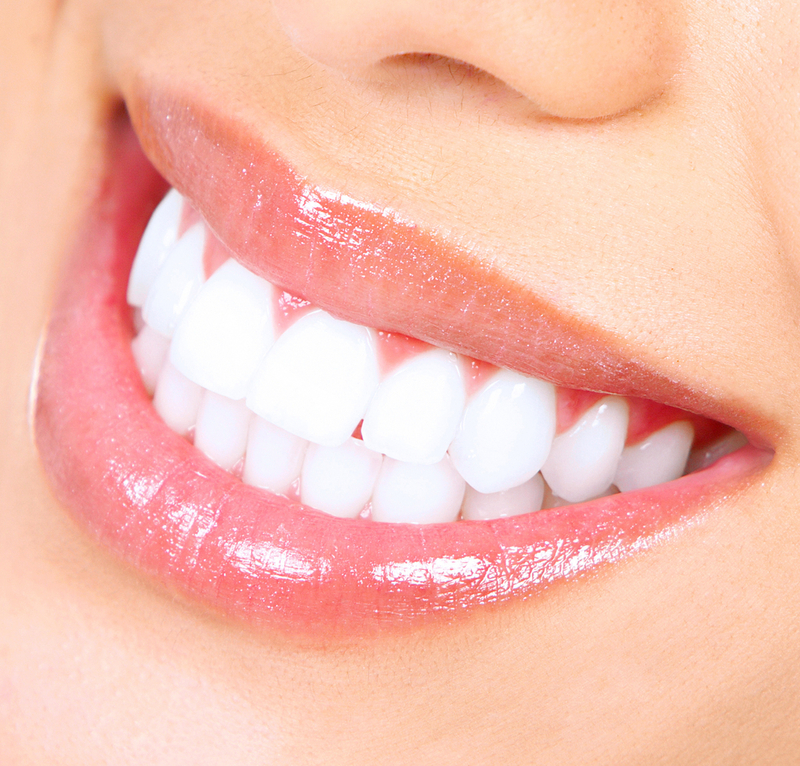 Teeth whitening removes stains by treating the internal and external structures of your teeth. Your teeth are composed of three main layers and the top two layers, the enamel and the dentin, are where stains adhere. Stains on the outermost layer, the enamel, are called extrinsic stains. Extrinsic stains are usually caused by consuming highly pigmented food or beverages, smoking, or poor oral hygiene. Extrinsic stains can generally be removed through brushing or professional teeth cleanings. Stains on the middle layer, or dentin, are called intrinsic stains. Intrinsic stains can be caused by the natural effects of aging, tetracycline-based antibiotics, and an overexposure to fluoride. Because intrinsic stains are internal, they cannot be removed by brushing and require professional teeth whitening. Professional teeth whitening uses various concentrations of carbamide peroxide or hydrogen peroxide to penetrate below the tooth’s enamel into the dentin. Once in the dentin, the whitening agents cause an oxidation reaction that breaks the chemical bonds of the discolored molecules. As the oxidation reaction continues to spread, it causes the teeth to return to their normal, white color. What should I expect during my teeth whitening procedure at Tyson Dental? Your teeth whitening procedure can be completed in-office at Tyson Dental or it can be completed in your own home. If you choose the at-home whitening treatment, Dr. Tyson will take a dental impression of your mouth to fabricate a customized mouthpiece. You will be instructed to fill this mouthpiece with whitening gel and wear it several hours a day for approximately 2-3 weeks. If you opt for the in-office whitening treatment, Dr. Tyson will begin by trying to determine the source of the stains and taking pictures of your teeth. He will then clean the surface your teeth to remove plaque, tartar, and any bacteria. Next, he will apply a concentrated whitening gel and activate it with a special light. Depending on the severity of your stains, your teeth whitening can take about three appointments lasting anywhere between 30-90 minutes each. It is important to note that the take-home whitening treatments have a lower concentration of whitening agents than does the in-office treatment. If you are looking for a quick whitening solution, then an in-office whitening appointment may be your best option. 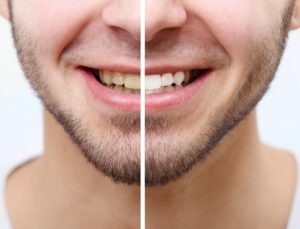 What should I expect after my teeth whitening procedure at Tyson Dental? After your teeth whitening procedure, you may notice some tooth sensitivity. This is normal and should fade within a few days. You may also notice some gum irritation, but this should also fade within a few days. For the first 24 hours after your teeth whitening procedure, you will want to avoid drinking any highly pigmented beverages such as tea, coffee, and red wine. The effects from your teeth whitening procedure should last for about three years, depending on your habits and oral care routine. Smoking or drinking highly pigmented beverages can decrease this lifespan. Brushing twice daily, flossing once daily, and visiting Tyson Dental twice a year for your dental cleaning can increase this lifespan. Ultimately, however, teeth whitening is not a permanent solution to discoloration. As such, additional teeth whitening sessions will be periodically needed to maintain results. Will teeth whitening work on fillings or dental crowns? Unfortunately teeth whitening only works on natural tooth surfaces and will not work on fillings or dental crowns. If you have dental restorations, such as fillings or crowns, Dr. Tyson may offer an alternative treatment. He may also need to replace your fillings after your teeth whitening procedure so that they match your new smile. Yes, teeth whitening is safe. The two active chemicals used in teeth whitening procedures are carbamide peroxide and hydrogen peroxide. Both these chemicals are highly similar to water in their chemical composition. Hydrogen peroxide is one oxygen molecule away from water and carbamide peroxide reacts with water to form hydrogen peroxide. Simply stated, both the active chemicals in teeth whitening treatments can be broken down by the body into water and do not cause any adverse health problems. Although teeth whitening is considered to be a safe procedure, it is still a dental procedure and has risks. The main risks for teeth whitening include prolonged sensitivity, technicolor teeth, and gum irritation. Prolonged sensitivity is a risk for those who already have sensitive teeth or those who have gum recession, cracks in their teeth, or a leaking restoration. 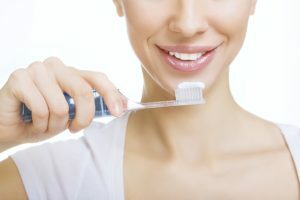 To combat prolonged sensitivity, Dr. Tyson recommends brushing with a sensitivity toothpaste containing potassium nitrate about a week before your procedure and continuing with this toothpaste after. Another risk of teeth whitening is technicolor teeth, which can occur when existing dental restorations remain their color while the natural tooth surface around them lightens. To avoid technicolor teeth, talk to Dr. Tyson about your options. The final risk, gum irritation, is usually due to exposure of the gums to bleaching agents or the whitening trays. To reduce gum irritation, make sure the whitening trays are fit properly and try to avoid contacting the gums with the whitening agents. The risk of gum irritation is significantly reduced with the in-office treatment. To see what a difference Teeth Whitening can make, schedule a consultation with Dr. Chase Tyson of Tyson Dental today! We are proud to serve residents of Huntsville and the surrounding communities.